I met Samantha though a local arts based nonprofit called Paint Love. 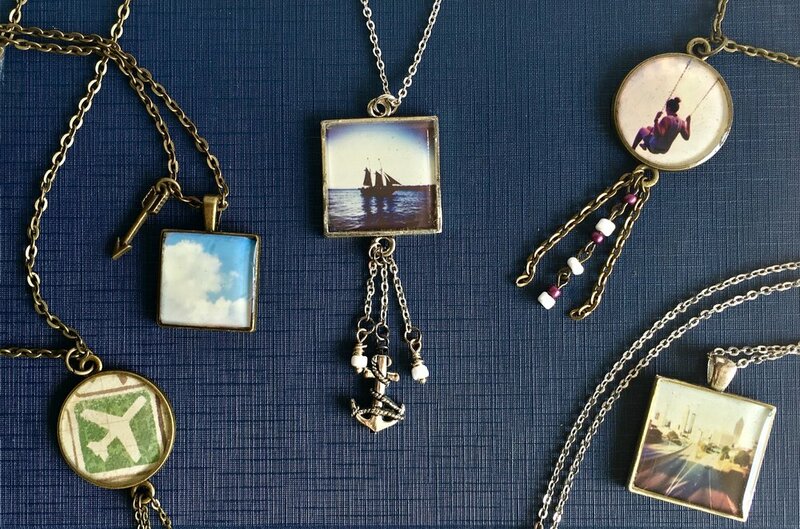 Samantha makes jewelry inspired by travel. Think Ireland’s grassy meadows, Ohio’s wheat fields, Arizona’s canyons, Atlanta’s hustling skyline, to pagodas in South Korea, and coffee shops near and far. Heart eyes! Sounds dreamy right? Take a peek into her process and story below - and don't forget to check out her work in person at the Maker's Mash on June 16th! I have always been sort of crafty and prefer to make my family and friends presents for different occasions. A couple years ago, I made a few personalized necklaces for my roommates at the time and as they wore them around, their friends and family noticed and started asking if I could make necklaces for them. It kind of took off from there. My day always starts with a good cup of coffee! Then it's a mix of working as an admin, working on jewelry pieces, trying out new recipes for dinner, catching up with friends. Sounds so lovely! What do you do to keep things fresh and inspired? My travels inspire me. When I am stuck in a creative rut, going on even a day trip somewhere can help me to come up with new ideas by just going somewhere new and talking to the people I meet along the way. A lot of my pieces are inspired by stories from people I have met while traveling. One of the hardest things I have learned probably be how to balance the creative side and the business side of things. Preach! What's your favorite part about making? Getting to hear the stories behind what draws people to different pieces. Most of my designs are inspired by places and people I have come across when traveling. Then when I go to sell these designs, I love interacting with people and hearing their story and what draws them to certain designs. Right now I am working on incorporating organics into my resin pieces, things like coffee beans and flowers. View Samantha's jewelry on Instagram and Facebook, and don't forget to check out her shop! See her in person at the Maker's Mash on June 16th!